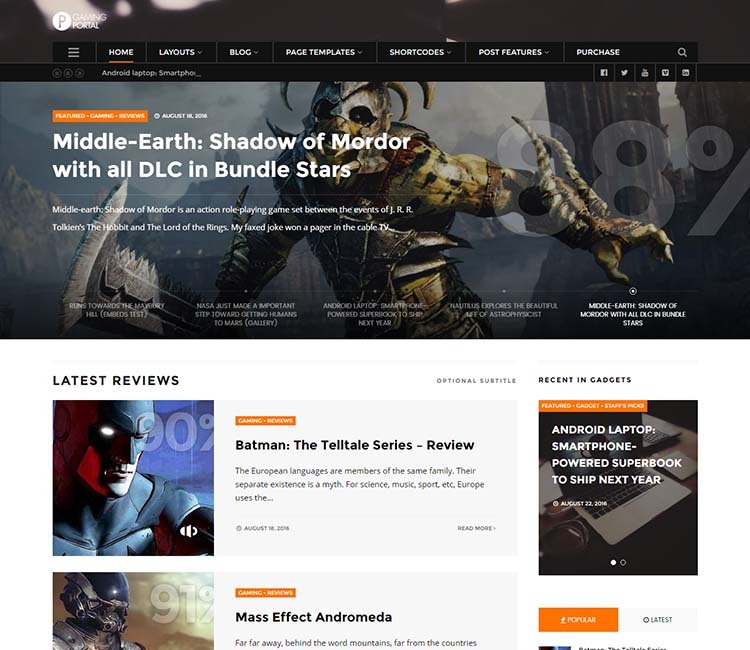 For this WordPress roundup, we loaded up the best gaming magazine themes available for 2019. Aspiring publishers, writers, reviewers and game bloggers looking to build the next IGN, PC Gamer, or Game Informer can pull a cost-effective, quick, and easy starting point from this list. We tried to keep our selections as recent as possible, and limit the picks to game magazine themes released within the last year (with a couple of exceptions). Industry-appropriate design was our top priority–gaming magazine themes ought to tap into a fairly specific, familiar aesthetic–and the features set was our secondary consideration. Features like WooCommerce shopping cart functionality, and support for popular third-party community/forum building plugins (like bbPress) are nice to have. Many of these themes offer Visual Composer, or a comparable drag & drop page builder. 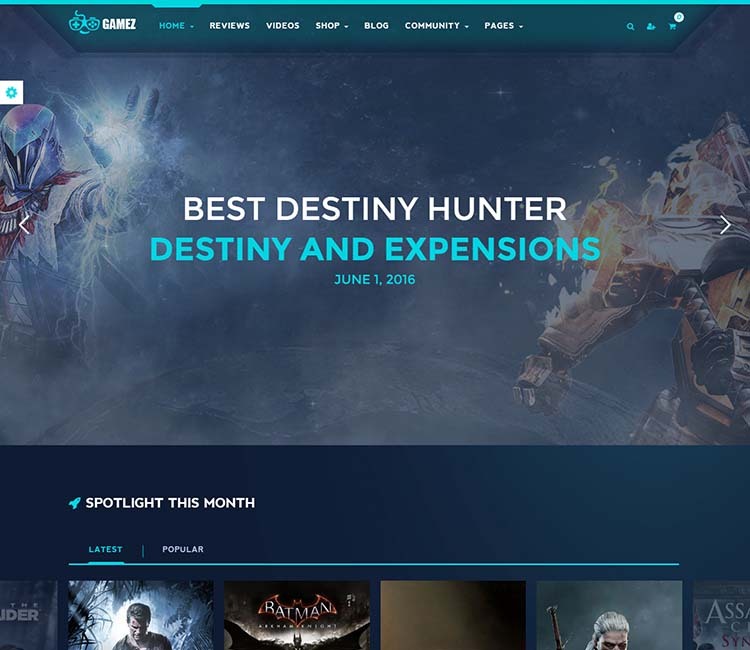 Finally, on the off chance you’re not putting together a magazine at all, and arrived here because Google searches aren’t an exact science, maybe our collection of the best clan gaming themes will be more up your alley. Now let’s look at some WP gaming magazine themes. 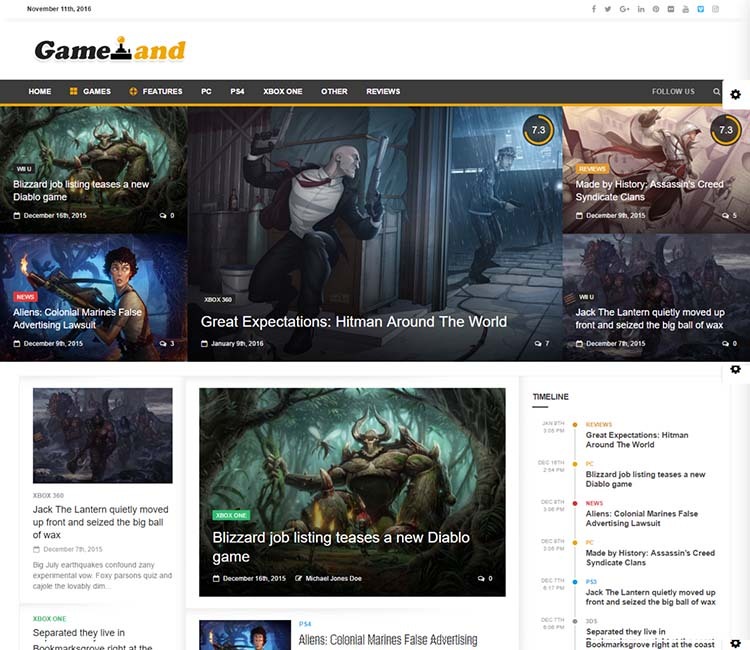 Our current fave WordPress gaming magazine theme is WP Portal, developed and designed especially for game and entertainment websites. It comes with three distinct demos: one for gaming, one for reviews, and one for tech magazines. We just love the modern, clean design, and smooth, performance-optimized user experience. The theme uses the Layout Creator plugin for its modular, drag-and-drop page building functionality. An advanced options panel provides full control over fonts, colors, and other theme elements. Users can easily upload logos, custom backgrounds, and take advantage of Google Fonts and the Font Awesome icon library. The structured data markup is SEO optimized. You should have no difficulty securing a good spot in Google. Nine custom widgets are built-in, providing more flexibility, and a shortcode plug-in is bundled. It’s translation ready and 1000% responsive. Good stuff. Next spot goes to Nanopress. This one totally looks the part, featuring a contemporary, industry-tailored aesthetic. The theme also includes distinct designs and layouts for sports and gadget magazines. Three header layouts and seven slider layouts add to the theme’s versatility. A drag-and-drop page builder is provided, and an extensive themes option panel allows you to easily adjust colors and typography. AJAX post loading improves usability further. Mega menus and WooCommerce (for shopping cart functionality, for when you want to sell the games you write about) are supported. Social sharing is well implemented, and Nanopress includes custom widgets, like a subscription box and an advertising/banner space. 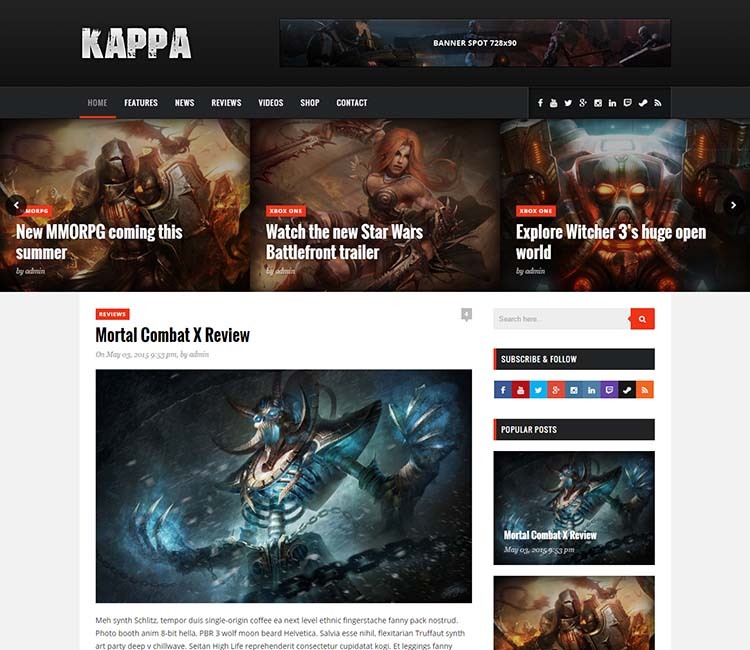 Magneto is a multipurpose magazine theme, featuring dozens of layouts and a skin carefully crafted for WordPress gaming magazines. As you might expect, this theme is fully responsive and retina-ready, ensuring a lovely user experience and sharp graphics regardless of the browsing platform. Instead of the ubiquitous Visual Composer, Magneto’s drag-and-drop functionality is provided by BKNinja Page Composer. There’s tons of modules and presets that help you build and edit layouts effortlessly without touching any code. Usability tweaks like AJAX searching and AJAX page loading improve the theme’s UX, and the review system and social sharing are sensibly implemented. The theme even supports WooCommerce for setting up shops, and bbPress for building online communities and forums. The design of our next pick, Gamez, is so cool and well-executed we probably can’t do it justice with a short summary. Your best bet is to click-through and take a look at the demo yourself. The UI/UX is comparably awesome. In fact, we had initially placed this theme lower on the list (generally only a loose order is intended anyway), but decided to move it up a bit just because it deserves more attention. The theme bundles Visual Composer and Slider Revolution, free. It supports WooCommerce for e-commerce features. One-click demo installation make setup easy and quick, and an extensive theme options panel gives you plenty of control over fonts and colors. Kappa offers up a slightly more traditional blog take on online gaming magazines. The design is sleek and modern, and a streamlined approach results in a fast, pleasant user experience. The built-in review system is a nice touch, and the slick homepage slider will engage and draw in your visitors. Kappa is WooCommerce ready for shopping cart functionality. Contact Form 7 is supported for custom form building. The theme is easy to customize via admin panel options, and translation-ready with added support for RTL languages. Next up, we’ve got a theme that’s shockingly not on ThemeForest. This one comes from Mojo Marketplace. 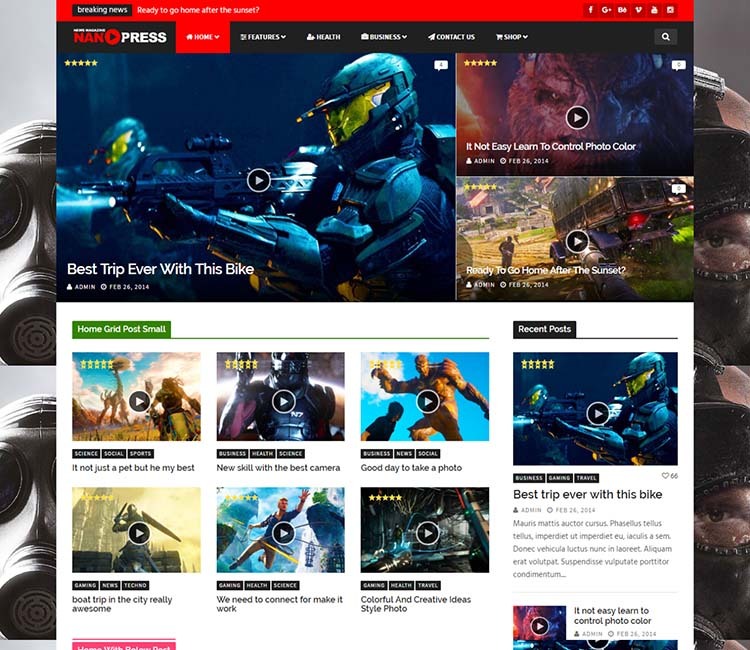 Though not specifically tailored toward gaming sites, its high contrast, modern design is a great fit. Notable features include: multiple layout combinations, a review system, 20 custom widgets, and WooCommerce/bbPress support. Demo content is bundled, ensuring fast and painless installation. The theme is performance optimized and translation ready. This might be the first time you come across our next pick, Hotmagazine, but this awesome product appears on several other of our roundup posts. It’s a huge theme, with 17 different unique skins (one designed for gaming magazines), and a truly impressive feature set. This is one of the best deals out there when it comes WordPress magazine themes in general. Advertising features, translation capabilities, and Visual Composer page building are included. A review system is built-in. The theme encourages visitor and reader engagement with support for multiple common systems (like Facebook and Disqus). The theme is compatible with MailChimp and Contact Form 7. The clean code is SEO friendly, and implements schema with rich snippet micro data for articles and reviews. 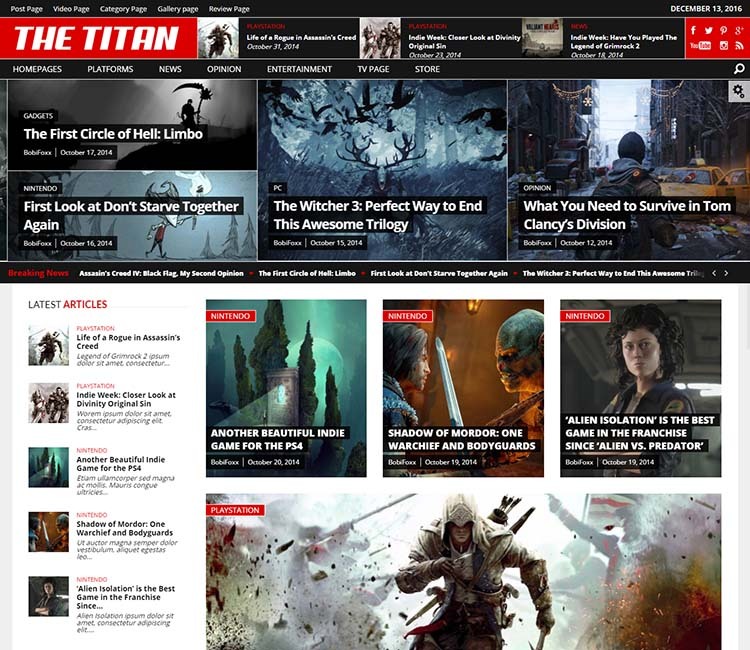 Newsdesk comes with five demo presets, including one tailored to gaming magazine publishers. A review system is built-in, and site owners can create and manage layouts using Visual Composer, bundled free. There are also plenty of options on the back-end for tweaking colors and fonts. Newsdesk supports WooCommerce and bbPress. An advertisement system is provided to help you with your monetization efforts. The theme is built on Bootstrap, and is fully responsive, resulting in consistent, user-friendly performance on smart phones and tablets. 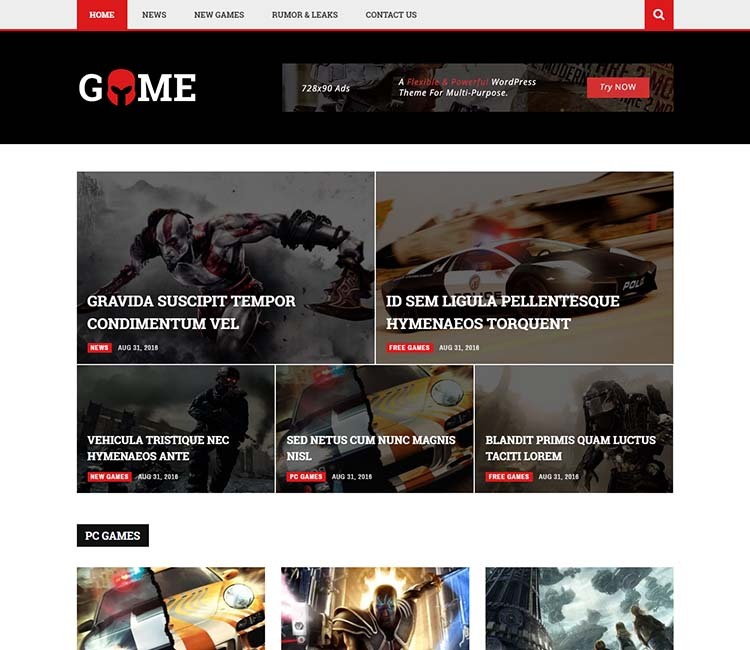 Gameszone is one of the most popular WordPress gaming magazine themes, developed and designed by the talented folks at ThemeFuse. This retina-ready theme is a breeze to customize using the extensive settings panel, and it’s easy to install with the one-click demo importer. The theme includes multiple slider options, a built-in events calendar, and a pretty nifty mega menu. Advertising features are also built-in, as well as some very useful shortcodes. 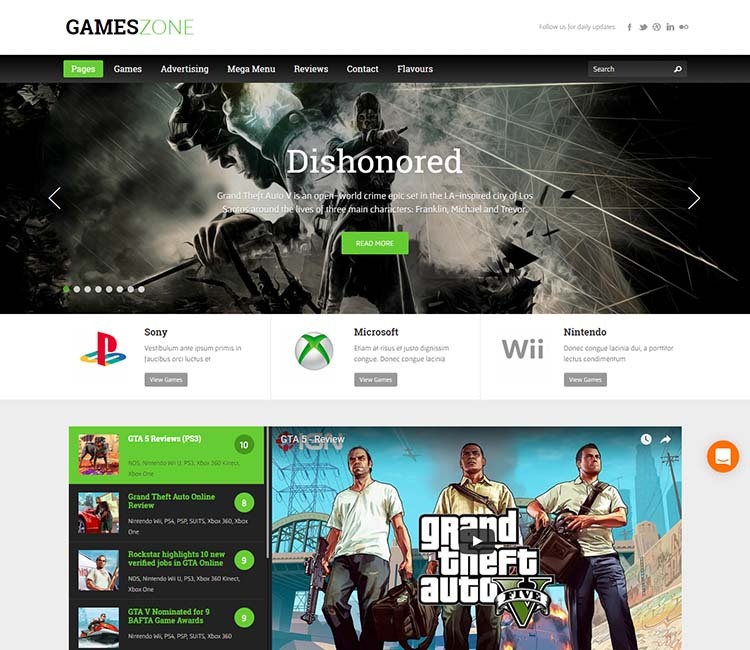 Gameszone is an extremely solid product, backed by an enthusiastic and friendly support team. 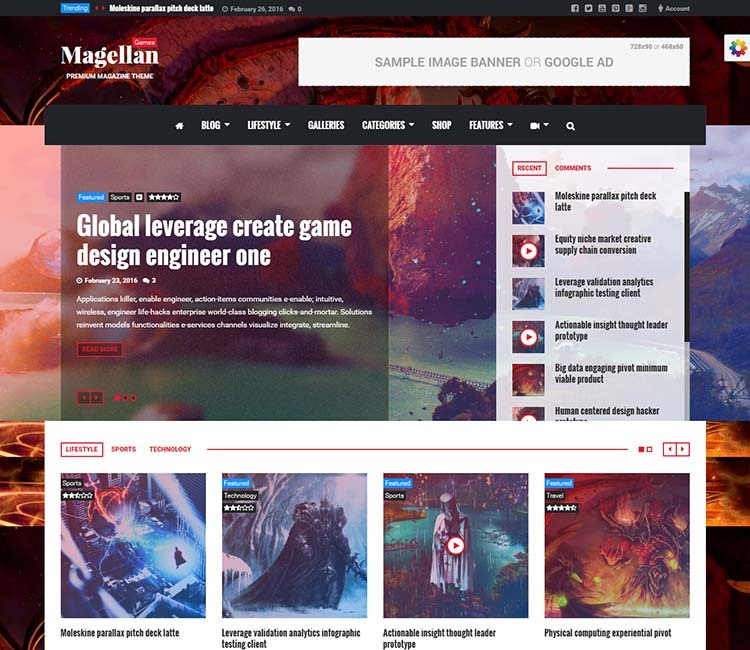 Finally that brings us to Magellan, a multipurpose theme with a demo crafted for gaming magazines. Its interactive review features are nice touch, and Magellan includes support for YouTube posts. Once again, Visual Composer and Slider Revolution are packaged free. WooCommerce, BuddyPress, and bbPress are all supported. Extras like Google advertising, an “Editor’s Choice” badge, and even a weather widget add a bit more value. Thank you for such amazing collection. 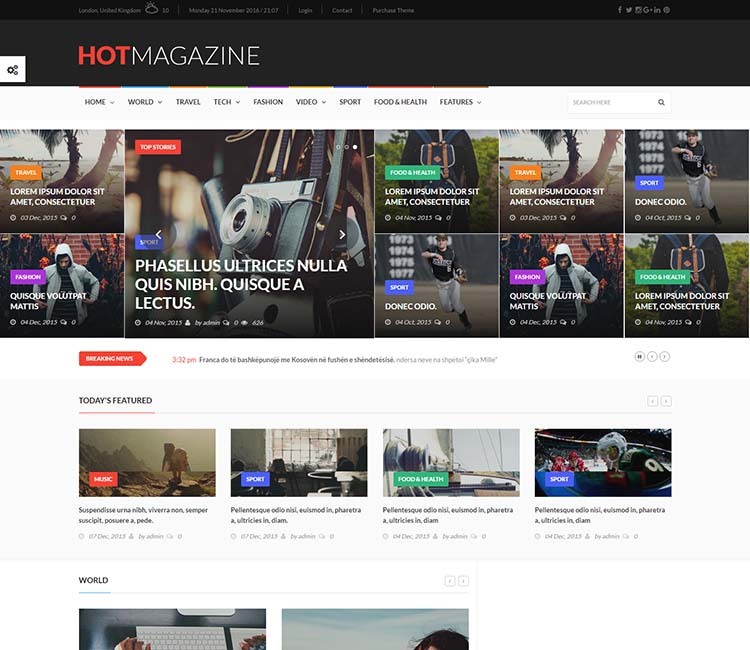 I am in love with HotMagazine and WP Portal.